INDUSTRY.co.id - Cikarang - The presence of an industrial estate, an area originally reserved for clustering or industrial clustering in one area, can then develop into a new city or new self-contained city. At least this is seen through the evidence and the existing track record of a developer named PT Jababeka Tbk. Since its establishment in 1989, PT Jababeka Tbk has been continuously seeking to build its reputation as the developer of the industry's largest and largest industrial area in Southeast Asia with an integrated industrial park in Cikarang, Bekasi with an area of ​​5,600 ha. Not enough to only succeed in developing industrial area, through its subsidiary PT Graha Buana Cikarang, Jababeka also develops an exclusive residential area on 500 ha of land. Precisely, Since 2013 then, residential area named Jababeka Residence began to be developed and managed by targeting the upper middle market. 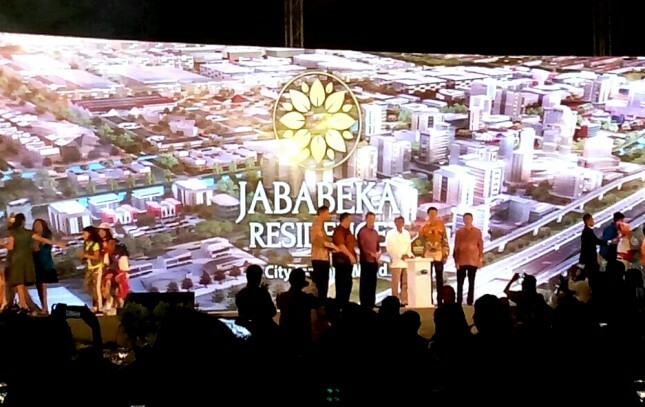 "Four years ago, we started the development of residential areas in Jababeka city, and today, we officially launched Jababeka Residence with a new logo that carries the concept of premium and targeting the upper middle market as a new branding and positioning from Jababeka Residence," said President Director PT Grahabuana Cikarang, Sutedja Darmono at re-branding Jababeka Residence in Cikarang, Bekasi, on Saturday (21/10). In front of 1000 more invited guests, Sutedja hopes that Jababeka Residence will be able to transform Jababeka City as the largest and most complete modern industrial area into a potential and exclusive integrated area. "In recent years, our presence has shown a very good progress for Jababeka City, as seen from the construction of a complete commercial facility and a large variety of property products for residential and investment in Kota Jababeka," Sutedja said. About the new logo, Sutedja also explained, That’s logo 8 pieces of leaves in the circle reflects the luck, harmony and premium image impression from Jababeka Residence. "This logo symbolizes nature, fertility, and growth. In Chinese belief, the number 8 represents perfection and fortune.8 large leaves and 8 small leaves are in a circle that describes togetherness and harmony and is expected to be in harmony with Jababeka Residence A City for Your World, where Jababeka Residence built almost all commercial facilities within the city area to meet the needs of the citizens, "said Sutedja. Just for information, Jababeka Residence shows, not just as a complement and a means of board for the workers who are in the industrial area Jababeka. To date, residential projects developed by Jababeka Residence are quite prestigious, such as the Mayfair Estate & Parklands superblock, a joint ventured project with PT. Plaza Indonesia Realty Tbk which is targeted to be completed by 2019. In addition, together with PT. PP Property, Jababeka Residence also developed the Little Tokyo project which includes the retail area of ​​Japanese Mall with six Japanese-style design and standardized apartment towers. Also, the most recent project is a joint project of Creed Group, a leading Japanese property company, to build a residential apartment with a resort concept called Kawana Golf Residence strategically located within the 18hole Jababeka Golf & Country Club and designed by world champion Nick Faldo.